Could you please say a prayer for me? I have a really bad vice of procrastination [from the Latin cras, “tomorrow”] that has gotten me into a heap of trouble at school and even frequent confession hasn’t helped. I’m still under academic probation from last year’s effects of procrastination. I can’t afford to lose my internship and get kicked out of school in my graduation year. 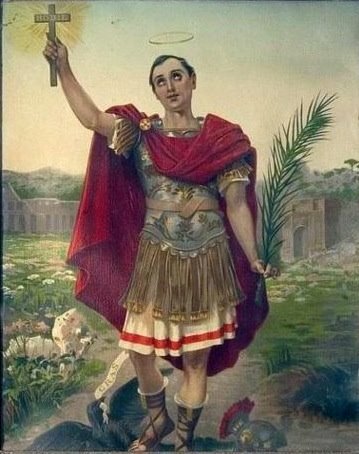 I’ve got the elbow grease and a novena to St. Expeditus to get me through the lag work of paper writing, but sadly it’s at the sacrifice of Thursday and Friday night Mass, so I need all the extra help I can get. A prayer for you? About procrastination? Sure, I guess I’ll eventually get around to it. Maybe tomorrow? Seriously, I always pray, right away, for people who ask for prayers. This entry was posted in Lighter fare and tagged procrastination. Bookmark the permalink. 30 Responses to Prayer for a procrastinator? I will keep this person in my prayers. I struggle with this also from time to time. I also struggle with this. A Novena to St Joseph of Cupertino has never failed when really needed. Also I was recently helped by St Dymphna over an issue of nerves/performance anxiety – of which procrastination is frequently a symptom. To aid concentration, I go to a distant corner of a public or university library – preferably at least a busride away, and stay for the day. This was a sign from God. I sympathize with your struggles. In fact, I have been in front of the computer delaying for quite some time now. I was about to get up and go somewhere to be more productive, when I decided to check my favorite blog, and this is what I found. St. Joseph the Worker, pray for us. A fellow editor/writer just sent me a cartoon labled THE MUSE MOST OF US REALLY NEED. It shows a stick figure pointing a pistol at an electron-stained wretch slaving over a hot computer and saying WRITE THE @#$%^&* STORY. Our procrastinator is not alone. Well . . . and why am I here, anyway? Procrastinating, of course. Prayers for your reader and for all of us procrastinators. I’ve been told that procrastination is substituting activities that are not important nor urgent for activities that are. I have a bad habit of procrastination. Usually, I’m playing around on the internet (like right now) or doing something to pass the time instead of the work that needs to be done. I’ve read that this is the sin of sloth. I wonder if that’s true. Yup. Welcome to my life. Prayers for you too. I too suffer from this horrible affliction. Don’t let it keep you back. It can cost you more than you know. Ave Maria gratia plena Dominus tecum benedicta tu in mulieribus et benedictus fructus ventris tui Iesus. Sancta Maria Mater Dei ora pro nobis peccatoribus nunc et in hora mortis nostrae. Amen. I am a terrible procrastinator. In the end, I just have to say to myself, “Does procrastinating make sense? What happens if I start working on it now versus later?” The hard part here is being honest and having the fortitude to do it then. Oh, and frequently checking blogs and e-mail is also a sign of procrastinating. D’oh! Oh, and saying a prayer for you now! I’ve been meaning to work on my own procrastination. Reminds me — I have library books overdue. I didn’t put this prayer off. Hard work pays off later, but procrastination pays off now! May our prayers be doubly efficacious if you are a seminarian. Asking for prayers doesn’t count as procrastination, does it? Midterm tomorrow on Sts. Augustine and Boethius. I will remember this student in my prayers. It could be a habit, could be substituting activities for others, could be sloth, could be block because of pressure/performance anxiety, and then again it could also be none of those. Sometimes one delays because one really does not enjoy the subject matter that one is required to learn and would rather avoid it altogether. And not every brain learns at the same pace or by the same process. Still we all have to live with (around?) the reality of tests, due dates and deadlines and for this prayer on another’s behalf can be a great support. I would advise the student that if the student really doesn’t love the subject matter but is en route to graduation and the next stage of her or his life, to see the work as a means to an end. One doesn’t have to love it to get through it and on to the next which may be more fulfilling. I’m the biggest procrastinator in the world; I got a birthmark when I was 8. When I was teaching, before January, I taught my students Time Management on the very first day, regardless of the subject. Time Management really means My Management, and I had students plot their entire week, from the moment they got up everyday to the moment they got to bed. I found, on average, an “extra” seventeen hours for work. The main problem with students is that they expect too much downtime, thinking they deserve breaks more often than needed. Also, they have televisions in their rooms, computer games, Internet chat, Facebook, etc, which all take way too much time. My suggestion is a severe look at discipline and time wasting. We, sadly, have a generation of kids who do not know how to discipline themselves for the sake of long-term goals, looking instead for short-term enjoyment. They expect entertainment everyday, instead of once a week, for example. I do not mean to sound harsh, but the golden work ethic has disappeared in most youth and needs to be re-taught. We need the old, Jesuit rules of education and the kind of rigor us older ones had in school and at home. People are astounded when they ask me about popular television shows in the 70s and 80s and I have never seen them. I was studying…. If this terrible procrastination is a habit, personality trait, or symptom of tension over an upcoming test or project, then it’s the usual (but difficult) type that we struggle with throughout life. However, note that if a person is NOT usually a procrastinator, and suddenly is putting things off, letting things slide, getting more behind THAN USUAL, that could be an indication of depression. Those of us who speak English learn when we are young that crows say “Caw! Caw!” Whether that is accurate is a matter for debate but that’s not my concern this morning. “Caw” is not an English word, simply an attempt to represent a sound with letters. I have read that the ancient Romans said that crows say “Cras! Cras!” Were the Romans, like us, simply attempting to represent a sound in letters or is there a more sinister meaning, since “cras” is a word that has meaning in Latin? Do corvids actually urge us to procrastinate? If so, are they urging us to play more, as they do, for our own well-being, or are they planning a coup against us once we are sufficiently weakened by putting things off and checking e-mail? We had best keep an eye on them. Anyway, those who said prayers for me, thanks. I appreciate it. APX: As no one knows you, how could they assume anything about you? People were writing about procrastination in general, don’t let it bug you. I’ll pray for you — been there, done that! And on the subject IN GENERAL (not APX), if you are an adult who frequently procrastinates no matter how hard you try not to, you might also have ADHD, which is a real brain chemical disorder and not something made up. Its major symptom is not being hyperactive but having problems with executive function — time management, organization, etc. If this is a problem for you, check out the book “Driven to Distraction,” which is all about recognizing ADHD in adults and what to do about it. My son has ADHD and I think I may as well, although if I do I learned to compensate. But if you have a terrible time keeping things neat, if you procrastinate despite trying not to, if you work best under deadlines and not at all without one, if you can’t keep track of dates, if you need to follow a system to get things done but always end up deviating from it, if you always underestimate how much time things will take, if you always feel a gnawing sense that you are behind and forgetting something, if you are late for everything… if you have several of these and similar problems, do yourself a favor and look into it. You may not have ADHD, but if you do you can learn to deal with it. Sometimes that means medication, but not always. Often it means really realizing your limits and getting someone else to help you with them — a family member or friend (for free) or a coach or assistant (for a fee). Not every unorganized person is lazy! Could it be a symptom of depression? There’s nothing worse than being in the grip of unconquerable procrastination when you are at university or self-employed. In the work world, there are structures built it that keep you going, but in school and at home, not so much. I feel terribly bad for this reader. We think of procrastination as a terrible moral failing, but as it is so powerful and brings no pleasure, I really think it must be linked to a mental illness of some kind. Prayers being said for you APX. I am frequently, much too frequently, in a similar position but in my own different life situation. Many sufferers and professionals consider that fear of failure and a sense of a need to obtain some elusive ideal of perfection are often a large part this difficulty. IMHO I don’t think it’s linked to a mental illness. It’s just putting things off, pure & simple. I know I have a hard time working on tasks I don’t enjoy (mostly at work)…because of the way our contracts work I have to log the amount of time I spend on each task, and that helps with accountability for tasks I find boring (if I know sooner or later someone will look at the time log, I want to be sure it’s there!). Otherwise perhaps a prayer to St. Thomas Aquinas – I believe he is the patron of students. First post here, so hopefully it’s helpful. As someone who’s had a lifelong procrastination problem, I’d like to recommend to your attention the book “The Now Habit” by Neil Fiore. There’s a good deal of fluff in the book, of course, but there’s also a lot of good advice. One of the fundamental things that I’ve learned from the book is that procrastination usually has as its source some sort of unresolved anger or unresolved fear/perfectionism. When you start dealing with the underlying causes of procrastination in the confessional, you make progress! For me, recognizing that the reason I put off doing some of my work was because I was angry at the person who’d assigned it was a great revelation– I was able to take my anger to God in prayer and to resolve it AND to resolve that I was not going to let my anger make me unprofessional. Also, not to scold, but procrastination can be a HUGE trial for a person, so I’d encourage future commenters to avoid making jokes about it. I’ve seen beautiful and promising careers derailed by it. I’m sure nobody meant anything personal! (I didn’t – been there, done that). Prayers of course. My own opinion (from personal experience) is that ADHD and other psychological issues may exacerbate procrastination, but they certainly don’t cause it, since almost everyone experiences it to some degree. He’s a patron against procrastination, but the voodoo/ santeria people have largely taken him over, which must embarrass him. In his case, the crow was clearly working for the wrong team, but I’m not sure how common that is. That very talented writer Rev. Charles Kingsley has a riff on the crows and their use of their gifts for evil in The Water Babies. He was an awful anti-Catholic bigot, but he got his head handed to him by Bl. Cardinal Newman. Thank you for your reply. I had never heard that particular story about St. Expeditus before, only the ones set in New Orleans, so I thank you for telling it to me, and also for the information about The Water Babies. I think it was about ten years ago when I learned that the Romans thought that crows said “Cras! Cras!” I had probably learned the meaning of “cras” in my Latin studies but I’d forgotten it. When I was studying Latin, I must have learned that crows say “Cras!” but that was long ago, when all Masses were in Latin. I have just noticed that “cras” is right in the middle of procrastination. Make of that what you will. It must have something to do with putting things off until tomorrow. I may be the poster being encouraged not to make jokes about procrastination but I’m only laughing at crows, not at people’s problems. I have enough of my own problems with procrastination and perfectionism not to joke about those conditions. Crows, on the other hand, amuse me. In any language. Not to mention that Fr. Z. made the first joke in this thread.